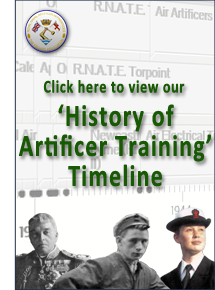 We are former Royal Navy artificer apprentices, most of whom served all or part of our training at the Royal Navy Artificer Training Establishment, HMS Fisgard or as part of the Fisgard Squadron in HMS Raleigh. Please feel free to explore our site using the links above. Comments and questions from non-members are welcomed via email at: . 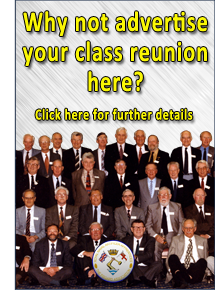 If you wish to join our Association, information on how to do so can be found here. Why not follow us on Twitter or like us on Facebook using the links above and receive the latest Association news and information direct to your smartphone or tablet pc. Please email website submissions to: . We regret to announce that Jim Green, Series 24 (1955), crossed the bar recently. Memorial page updated. We regret to announce that Geoff Morgan, Series 3 (1948), crossed the bar on 27th March 2019. Memorial page updated. Geoff's funeral will take place at 1330 on Tuesday 16th April at the Holy Trinity Church, Fareham. All are welcome. We also regret to announce that Alan Lloyd, Series 25 (1955), crossed the bar on 1st March 2019. Memorial page updated. We regret to announce that James Holt, Series 55 (1965), crossed the bar on 5th April 2019. Memorial page updated. 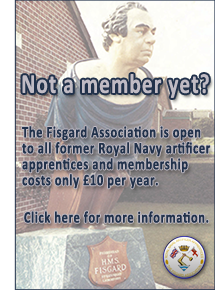 Fisgard Association Scotland & NE Chapter, Lunchtime 'Pint & a Pie' Meet at Perth Ex-Servicemen's Club. Fisgard Association Southern Area Spring Lunch at Royal Maritime Club, Portsmouth.